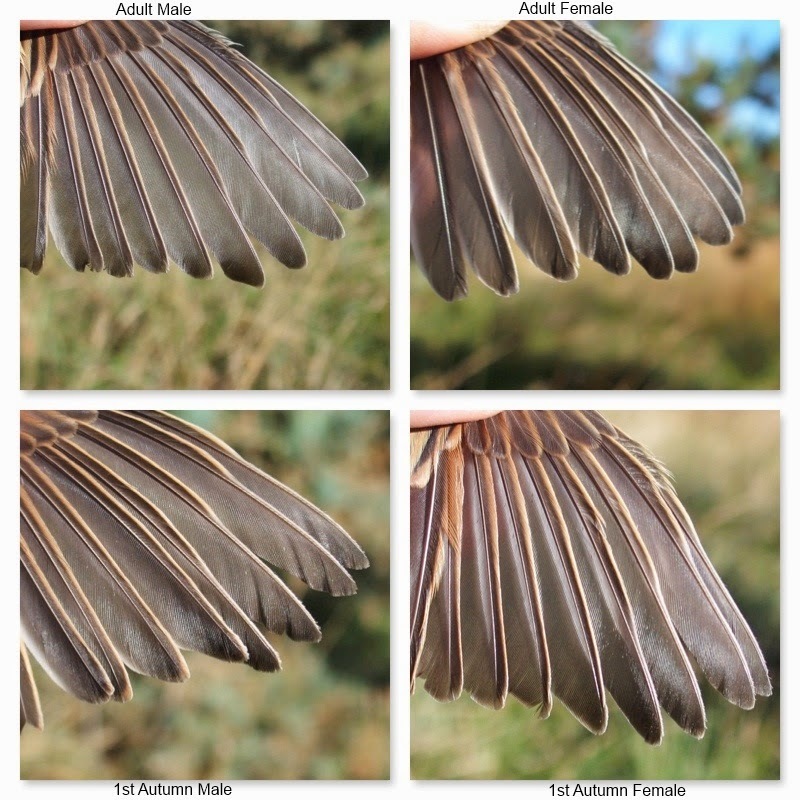 All photographs were taken on 5th October 2014 and are of four individuals (plus a fifth which better illustrated the alulae and primary coverts of a 1st autumn female). Sexing. 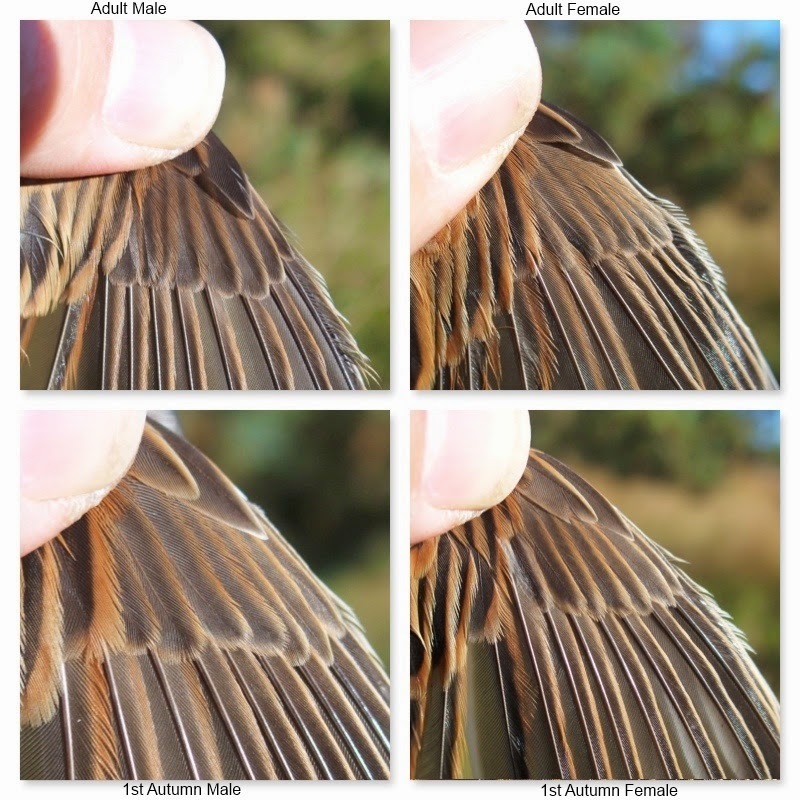 The pattern of black and buff on crown feathers is straightforward at this time of year - the black base to the crown feathers in males is broad with 90%+ of the buff restricted to the feather tips. In females the black parts of the vanes form arrow-head shapes with the buff extending down from the feather tip either side of the black. Ageing. 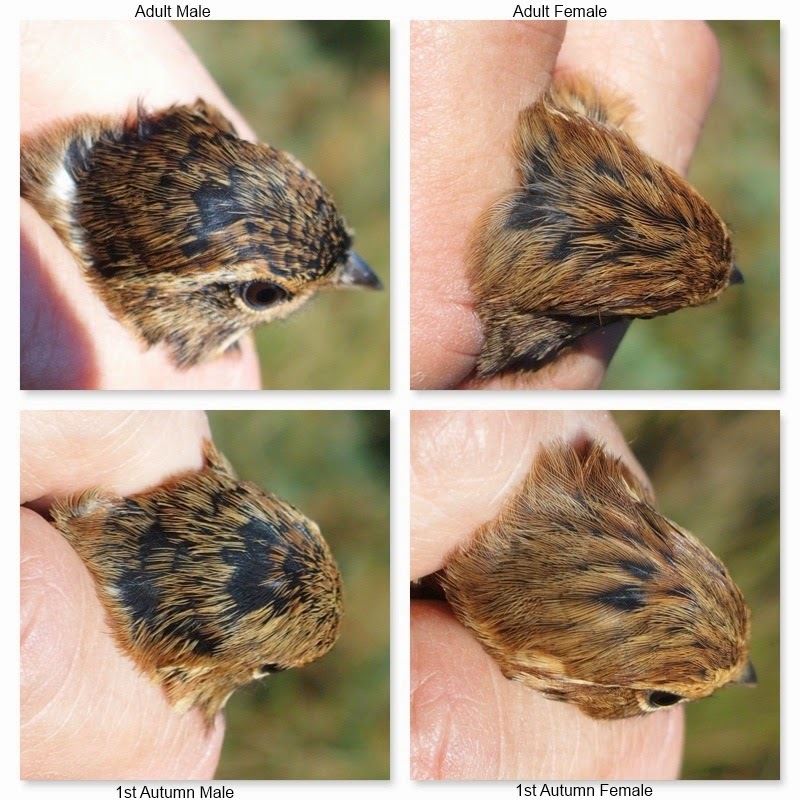 The two males follow the literature: the adult has neatly rounded primary coverts whereas the young, while still rounded, are more loosely defined; both along their edges and around the tips. 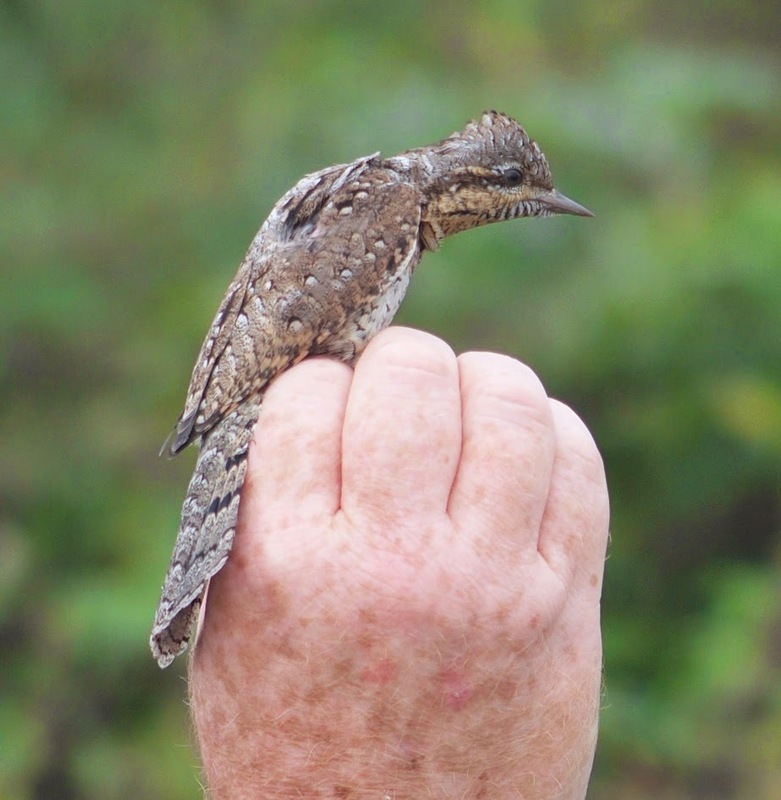 The females are harder to differentiate though the 1st Autumn bird does have greater wear than both adults. Note that both adults exhibit dark outer alulae whereas both juveniles are paler. This isn't something I've read and we'll check future buntings as a follow-up. If anyone has a reference for this criteria do get in touch and I'll update this post. Ageing. One has to look carefully to judge the amount of primary wear in Reed Bunting and even in October, a cursory look is often not enough. Compare the lower two birds with those above: the young male exhibits the most wear but the young female also has greater wear than both adults. Using the primaries for ageing gets progressively more difficult as the season progresses. Ageing. Reed Bunting have broad outer tail feather but it's the shape that can help age a bird. 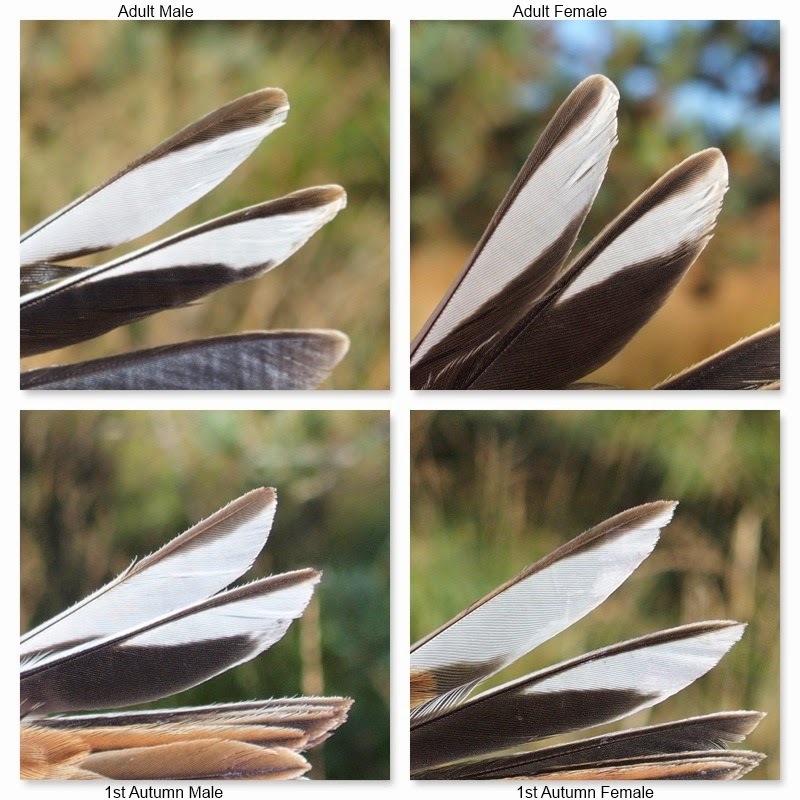 Adult tail feathers are rounded at the tip and, in October, generally show little wear. Juveniles are more pointed and a close inspection will show a greater degree of wear. Good weather and extra activity at Wraysbury and Tythebarns gave a welcome total of 1,294 new birds (924 Runnymede RG; 370 Maple Cross RG). Blackcaps were the most numerous species totalling 370 (including 198 Wraysbury, 108 Tythebarns and 24 at both Hilfield and Bedfont) followed by Chiffchaff at 198 (including 76 Tythebarns, 52 Wraysbury, 36 Chobham and 19 Broadwater). Meadow Pipits also featured highly at 105 (57 Hilfield, 31 Chobham and 20 Bedfont) and Goldfinch made a healthy 80 (mostly at Wraysbury). 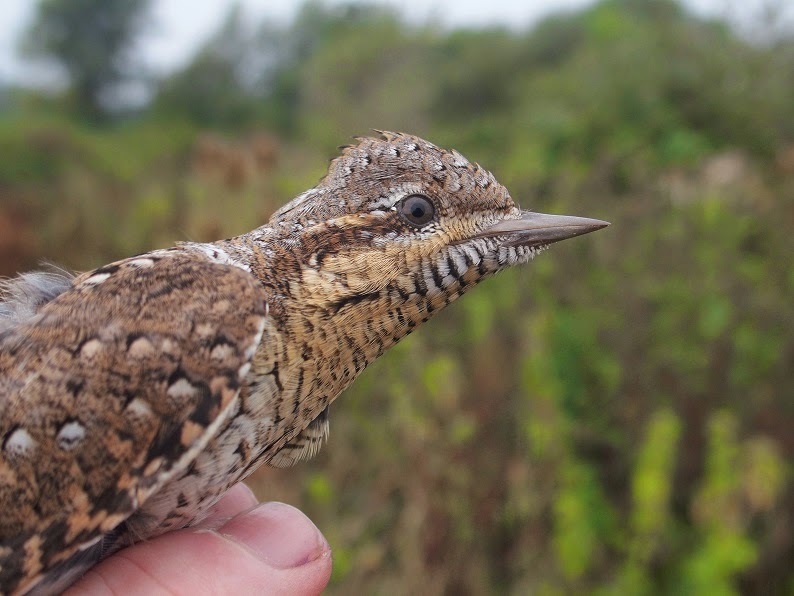 A total of 45 species were ringed (37 Runnymede RG: 29 Maple Cross RG) with the premier being a Wryneck at Wraysbury. Tree Pipit appeared at Chobham, Grey Wagtail at Windsor and Redstart at Wraysbury, with Tree Sparrow and Yellowhammer at Willows. A Pied Wagtail we ringed at Bricket Wood in December 2010 was caught again, this May, 300 miles north in Peebles in the Scottish Borders.